How can computing and emerging technology enact the inclusion of the disabled or underrepresented in societal activities and experiences? The study suggests an innovative way of using intelligent robots to help develop the auditory skills for Deaf and Hard of Hearing (DHH) children through play. NAO does not have a human mouth and therefore DHH children cannot do lipreading; this unique characteristic of the technology has been successfully used in this study to create playful and engaging auditory-verbal therapy sessions for DHH kindergarten children, allowing them to improve their listening and hearing skills. In the contemporary multicultural classroom of the 21st century in which students from diverse ethnic and cultural backgrounds learn together, it becomes necessary to embrace collaboration, social perspective-taking and understanding of the ‘other’ to help students comprehend their classmates’ values and perspectives. The study presents a case of practical utility and impact of tabletop research in this arena. We present evidence of perceived collaboration and learning around the tabletop, as well as gains in social perspective-taking propensity, demonstrating the promise of the use of interactive tabletops in the multicultural classroom. In this work, we describe the development and evaluation of a system aiming to meet the communication needs of hearing impaired citizens in cases of emergency. The system consists of (i) a mobile application that records and sends the details of an emergency event, and (ii) a central management system that handles these calls from the operation center at the emergency services. The system was completed in four cycles of design, development, and evaluation with the involvement of 74 hearing impaired users and three officers from the Cyprus Police (Emergency Response Unit). The study suggests a practical use of augmented reality (AR) in supporting Deaf and Hard of Hearing (DHH) students. First, we used AR via wearable glasses to support the communication and feedback loop between the instructor and DHH learner during the lesson. Second, we used AR via a typical tablet to support the DHH students in acquiring vocabulary and subsequently, improving their reading-comprehension capabilities. 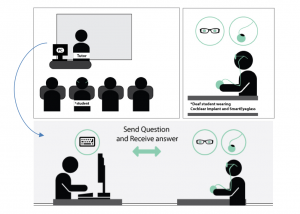 The study demonstrates the utility of AR technology in real-world settings, serving the needs of special education students, in this case, those with hearing loss, potentially contributing to more inclusive classroom environments in mainstream schools. The aim of the project is to develop a novel usability inspection method that can be applied to measure the usability and user experience of websites that are designed for Deaf users. The usability inspection method will be in the form of a heuristic evaluation that can be used by HCI experts and developers alike. It will be required to understand the unique characteristics of Deaf user interactions with websites and to examine existing web design guidelines and principles for Deaf users. In addition, a process must be applied for developing new heuristics for specific application domains.